Myanmar [Burma] authorities finally released Aung San Suu Kyi on November 13 after confining her for nearly 15 of the past 21 years under house arrest. She is my Person of the Year for her courage and determination as well as for defining the very meaning of non-violent political struggle. An equally worthy candidate may be Stéphane Hessel, a 93-year-old former French resistance hero who penned a 30-page bestseller Indignez-vous! [Be Indignant! ], "which calls on readers to get angry about the state of modern society". Both of these examples provide ample food for thought as we reflect on the past year and prepare for the next one. Alert readers will surely know of the Burmese opposition politician who won repeated elections in her country only to see the military dictatorship nullify results, refuse to hand over power, and deny the free will of a majority of that hapless country's population. 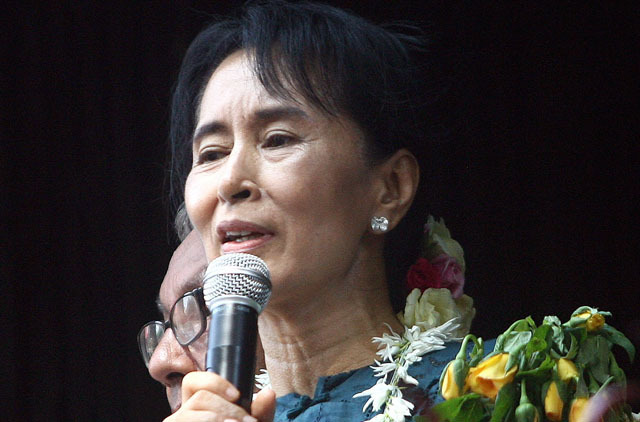 Year after year, and calamity after calamity, Dr Suu Kyi (she earned a doctorate from the School of Oriental and African Studies at the University of London in 1985), endured. When Cyclone Nargis struck Myanmar on May 2, 2008, Daw [Aunt] Suu, as the Burmese often refer to her, lost the roof over her house. Forbidden to repair her home or to purchase a generator to supply electricity, the indomitable Daw Suu lived in virtual darkness in what quickly became a dilapidated lakeside residence. Like Soviet prisoners in concentration camps, she used candles at night, wrote, and contemplated how to restore civility to Yangon [Rangoon]. The recipient of several prizes, including the Nobel Peace Prize (1991) when the latter had some value, Daw Suu stood firm in her beliefs that people were entitled to be free and manage their affairs with dignity and justice. "In the good fight for peace and reconciliation," declared 1991 Nobel Committee Chairman Francis Sejersted, "we are dependent on persons who set examples, persons who can symbolise what we are seeking and mobilise the best in us. Aung San Suu Kyi is just such a person ... Knowing she is there gives us confidence and faith in the power of good." As determined as our Myanmarese heroine, Stéphane Hessel's charisma and his life story are worthy of reflection too, for the nonagenarian pondered how Nicolas Sarkozy's presidency was irredeemably changing France. According to Angelique Chrisafis, who reported the news in the Guardian, Hessel "was born in Berlin in 1917 and emigrated to France" at the age of seven. During Second World War, he joined General Charles de Gaulle and served in the resistance, "was caught, tortured and deported to Buchenwald and Dora concentration camps where he escaped hanging." After the war, Hessel became a diplomat, and helped Charles Malik of Lebanon and Eleanor Roosevelt of the US draft the universal declaration of human rights. Importantly, this distinguished individual spoke truth to power, long before his latest tract appeared. In January 2009, for example, he spoke clearly against the Israeli military operations in the Gaza Strip, while André Glucksman, Alain Finkielkraut and especially Bernard-Henri Lévy, three of France's mendicant "philosophers" explained away and even justified the indescribable bloodshed. Hessel proved to be more honest when he declared: "In fact, the word that applies — that should be applied — is war crime and even crime against humanity." Similar to Daw Suu, who exemplified the spirit of non-violent resistance, Hessel is now urging his countrymen to re-embrace the values of the resistance. "This is an appeal to citizens, young and old, to take responsibility for the things in our society that don't work," he wrote, and "I wish every one of you to find your own reason for indignation. It's precious." Like the Myanmarese champion of human rights, Hessel has called for peaceful and non-violent insurrection, which only requires that all us become more indignant and outraged when we witness injustice, violence and poverty. Compare Suu Kyi and Stéphane Hessel with Time magazine's ‘Person of the Year' for 2010, Mark Zuckerberg, the 26-year old founder and CEO of the online portal Facebook. While some may believe that 600 million members cannot be wrong in the way they think about relationships, one wonders whether the social networking behemoth may not be a total waste of time, and whether any one individual on earth ought to have several hundred or a few thousand close friends with whom one shares every detail of one's life. Few ought to doubt that in fast changing technological rollercoaster races, the latest Twitter, or similarly entertaining and entirely tangential discoveries, will eventually replace the Facebook phenomenon. Calls made by Suu Kyi, Hessel, and truly magnificent human beings like them, will awaken and sharpen our senses for justice. This is critical to live with honour and dignity as our goals ought to make everyone safe from violence, secure in their properties, valued for their contributions, and ensured in the equal dispensation of justice. Those were the criteria used to choose persons of the year in this column, individuals who work to add value and give meaning to our lives, rather than add noise to the immense void of the electronic universe.